One of our customers had the unfortunate experience of encountering a bat in her home. The bat was seen at one point in her closet. Our technician visited the home and started his bat search. He looked all around the house, including inside closets, in the bedroom and bathroom. After looking, he finally discovered the bat laying in her flower pot under a plant. He took the bat and placed it in a box with some tissue to help keep it warm. After, the bat was given to Sandy Pines Wildlife Center, where they would keep it safe until it could be released when the weather was warmer. In the end, the client was pleased to have the bat removed safely, and the bat was taken care of in a humane way. Bats can enter through any dime sized hole that allows access into your home. The most common entry points are spots where the brick meets the soffit, around chimneys, around flashing, and through attic vents. Bat entry points can be spotted by looking for staining and droppings. During the winter, bats look for warm places to hibernate. They will often find their way into attics of homes, and crawl into insulated spots that are ideal for hibernation. However, sometimes they will crawl through walls and end up finding their way into the living spaces. They become trapped and unable to escape, making it a problem for themselves and for you. When a bat lives in your home it will excrete droppings called “guano”, and urine. These can cause strong odours in your home. They might also be carrying harmful diseases. They might also cause damage to building materials on the outside as they enter, and also once they are inside. 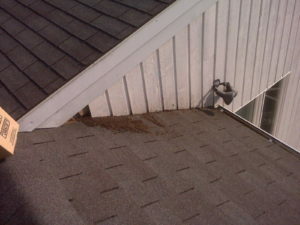 Technicians look for bat droppings like in this picture, that lead them to where the bat is getting into the home. Here, the bat is getting in through a hole at a roof intersection. 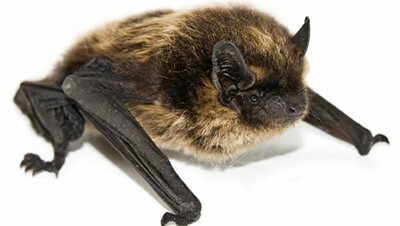 If you suspect that you have a bat or some type of wildlife living in your home, it is best to seek professional help. One of our wildlife technicians will visit your home and complete an inspection to determine how the bats entered, and where exactly they are living. They will look any signs of bats, such as staining and bat droppings. The next step is removal of the bats, which is done by installing a one-way door to allow exit and prevent re-entry into the home. They will also seal any other possibly points of entry to ensure that they cannot find another way into the home. Greenshield Pest Control also offers a variety of warranties to make sure that your problem does not persist. Call us today if you are having bat problems. We will be happy to give you more information and help you solve your bat and wildlife problems.